Dogs bark at the door when guests arrive because they are aroused, excited, fearful or startled. Counter condition your dog to triggers that happen prior to a visitor walking through the door. This means basically create a positive and calm association to all the sights and sounds that happen before and as a visitor arrives. The sound of the gate- Get someone to go and make the noise of the gate, while your dog is watching on leash. A millisecond after the noise occurs FEED a treat. Make sure the NOISE is the predictor of the food and not your hand movement. So be sure to only make any movements AFTER the noise occurs to deliver the treat. Next proceed by closing the front door and continuing the exercise while the dog cannot see but can still hear the gate. The sound of the door- Knock on the door while on the inside of the door with your dog. Knock softly and drop a treat. For some dogs this is such a trigger that you may need to start with the dog on the outside of the open door, so the dog is in a different situation than the trigger situation where the door is closed. Some dogs might even need you to knock on a table or the floor first before moving to the door because it is such a trigger already. Repeat this step until the dog is happily expecting a treat. You can then knock louder and louder, feeding a treat for each knock. Now have a friend or family member knock on the door while they are still in the room with the door open. If that is successful, have the person go on the outside of the door and knock while the door is closed. Opening it every once in a while so the dog can see it’s their favorite person on the other side of the door. The doorbell- Ring the bell while the dog is outside with you. Feed a treat directly after the bell rings, making sure that the bell is the first predictor that a treat is coming and not your body movements. Repeat until the dog is comfortable, then move the dog back inside. Get a friend or family member to ring the bell while you are on the inside of the doorway. If the dog is relaxed and succeeding have your friend ring the bell with the door closed. Feed the dog after the sound of the bell for remaining calm. If the dog barks you can say “lets go” and move the dog away from the door on leash. Barking is reinforcing so you must not let it continue or you will literally be training the dog to always bark at the sound of the bell. This goes for any of the counter conditioning exercises. Opening and closing of the door- Touch the handle, click and treat or drop a treat for the dog while he is remaining calm. Turn the handling click and treat- or simply feed the dog a treat. Jiggle the handle, click and treat. Go back a step if your dog gets too aroused. Or start with the door open as you make noises with the handle of the door. Obviously if your door leads to the street always have the dog on leash or a long line so that he doesn’t rush out the door. Footsteps outside- For some dogs it’s the sound of footsteps coming towards the door that is a trigger. To solve this, go outside, and practice different walks up to your door with your dog at first, feeding the dog for watching and listening to you stomping and shuffling your feet. Then have a friend or family member do the same- feed the dog for staying calm while the noises happen. Feed the dog for orienting to the noise rather than just staring at the treats you are holding. Next close the door and feed the dog after each noise that occurs outside of the door. Open the door every once in a while to show the dog that it is just their friend or family member. Ring the doorbell, knock on the door, make heave footsteps when you return home from work each day, so the dog has a positive association of you returning home with the sounds. Start off with someone you live with (if possible) leave and come back through your front door without closing the door. Click or simply feed the dog for watching then come through the door, while standing calmly and doing nothing on a loose leash. Next have the person leave, close the door and come back in immediately- you can feed or click your dog for remaining calm and relaxed for each of the triggers (the door noise, the person entering etc). Have the person go in and out, multiple times. You can feed or click the dog for the person leaving as well if your dog has issues with people leaving the house as well. Now have the person ring the bell or knock (make sure you have worked on counter conditioning your dog to these sounds first before adding them into the mix) before he comes in. You can feed your dog for the noise of the bell, the door opening, as well as the person entering for remaining calm and relaxed. If the dog barks, simply say ‘lets go!” and walk the dog away from the door. Now repeat all these steps with different family and friends, and then complete strangers to the dog. Make sure you keep the dog on a secure leash if your dog is reactive to people to avoid the dog biting the person if startled. When the person comes through the door, have the dog as far away from the door at first so that he doesn’t get overwhelmed. Also have the new guests first meet the dog on the street (as outlined in the management section) before beginning the more surprising greetings. When you do have REAL guests. Getting them to leave and come back in the door multiple times can really speed up the process of calm behaviors when guests come over because you will be habituating the dog to people entering the house. Your dog should think that people come and go and it happens all the time. Not that they just come in once, and that is when the dog should get very excited. Enter the house when you return home through the door guests will enter through, so it no longer abnormal to the dog to see people enter through that door. Make your own daily greetings towards your dog calm and mellow. If you allow your dog to get excitable every day when you come through the door, how do you expect your dog to be calm when a visitor arrives? If you must have an excited greeting with your dog, enter the house, wait 5 minutes and THEN greet your dog excitedly. Firstly you will find your dog will be much calmer and secondly you will not be making ‘a person entering a doorway’ a trigger to get excited. Ask your guest to call when they arrive. Go into the street with your dog on leash and have the guest walk into your house while you follow the guest at a distance that your dog can cope with and be calm and take food at. For some dogs that might be 10 feet, for others that might be 20 feet at first. The guest can ignore you, or offer calming signals. They should not stare directly at the dog or shout “WHAT DO YA WANT ME TO DO NOW?” etc. They can speak in a soft friendly voice if your dog is ok with that. If you have more than one person living with you, you can get that person to go and greet the visitor in front of the dog while you stand back with the dog on leash. 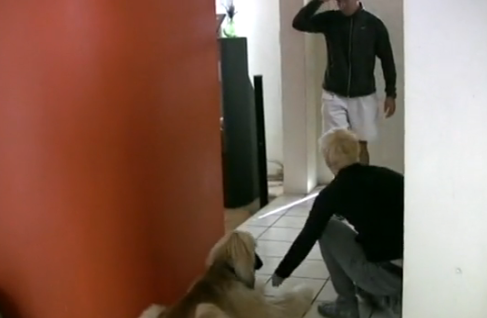 You would be feeding the dog for calmly looking at the two people greeting each other. Thanks for the article, working with my two young dogs one of which is very reactive. REALLY helps to see/read the exercise broken down into baby steps so to speak. I find it's so easy to get overwhelmed myself...have to remember to start small, work up to the actual thing that sets them off.